Enter the world of Watercolor Harps. ...audible imagery to help you feel it, play it, share it! Solos & Duets designed to bridge the gap between the spectrum of emotions & colors to inspire you. 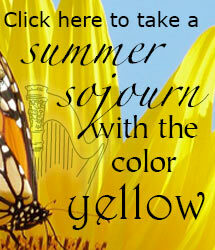 Follow Watercolor Harps's board Harp Music Inspired by the Color Yellow on Pinterest. "I keep Watercolor Harps' "about yellow" CD in my car and listen to it everyday and it boosts my spirit as I drive into work." "One of my students and I are playing 3 Watercolor Harps duets for my annual recital in November. We are really enjoying them. I'm going to add a solo or two of yours plus other things so that I can call the concert "Watercolor harps." We are even having back lighting in Blue, Yellow and Green!... I CAN'T WAIT for the rest of the colors to be released." © 2014 Watercolor Harps. All Rights Reserved.